Romney Pulls Jimmy Carter Into His Bin Laden Fight With Obama : It's All Politics Talking to reporters Monday in New Hampshire, the unofficial GOP presidential nominee, Mitt Romney, summoned Jimmy Carter's name in defending himself against Democratic attempts to raise doubts about whether Romney, like President Obama, would have ordered the raid that killed Osama bin Laden. 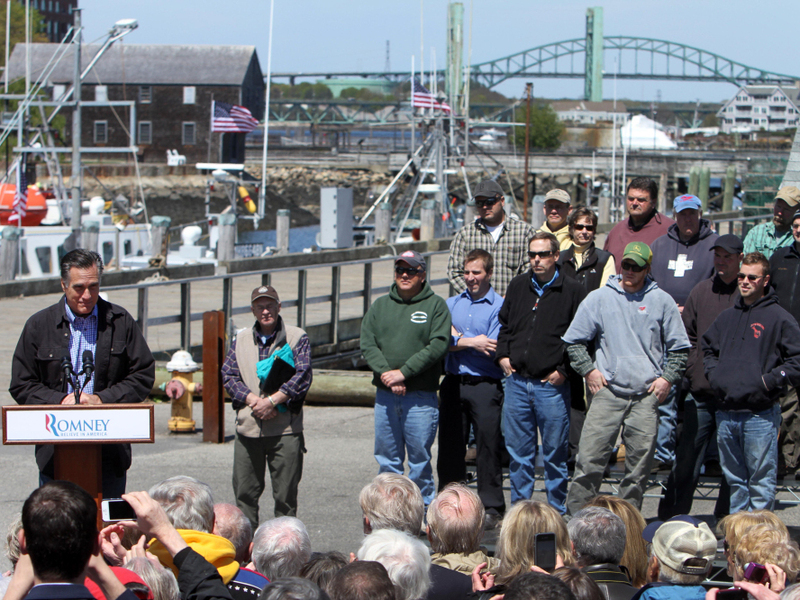 Mitt Romney fished for votes among fishermen in Portsmouth, NH, April 30, 2012. Former President Jimmy Carter was no doubt minding his own business, which these days usually means being some place in the world doing good works, when his name came up in the 2012 presidential campaign, and not in a good way. Talking to reporters Monday in New Hampshire, the unofficial GOP presidential nominee, Mitt Romney, uttered Carter's name in defending himself against Democratic attempts to raise doubts about whether Romney, like President Obama, would have ordered the raid that killed Osama bin Laden. "Even Jimmy Carter would have given that order," Romney said after a campaign event, giving the 39th president a backhanded compliment if ever there was one. Romney and conservatives have pushed back hard against the Obama campaign ad released Friday that credits the president with decisively ordering the Navy SEALs into action to take out American enemy number 1 last May. The ad questions whether Romney would have done similarly based on a 2007 comment of his. During that presidential campaign he said: "It's not worth moving heaven and earth spending billions of dollars just trying to catch one person." For what it's worth PolitiFact has weighed in on the controversy. It concluded that the Obama campaign's intimation that Romney's words would lead one to doubt his desire to get bin Laden was "half true." PolitiFact, the journalistic fact-checking operation, based this on the Obama campaign's failure to credit to Romney a later clarification he made at a Republican presidential debate in which he said he would, of course, go after bin Laden but that the war on terror was bigger than the terrorist leader.